Toddlers are highly energetic and always on the move, making shoes a necessary part of their wardrobes. They are also constantly growing, which means that parents always need to be ready to acquire new shoes for them. Infant and toddler shoe sizes are not, however, on the same scale as adult shoes, and it is important that you know how to properly size your toddler’s feet. 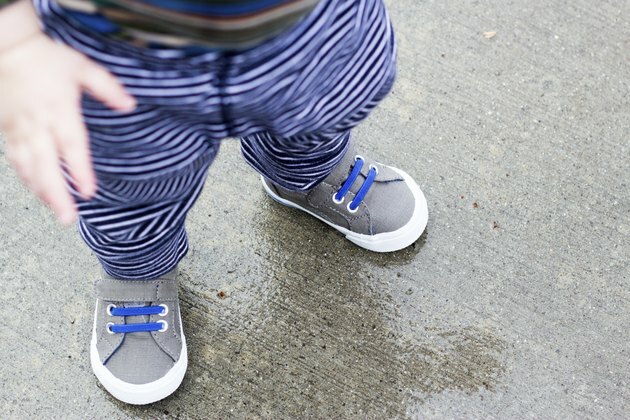 With the right shoes, your toddler will be able to keep going at full speed. Estimate your toddler’s shoe size. If you double the child’s age in years and add either 2 for a boy or 1 for a girl, you should get a rough idea of the correct shoe size. This method approximates the correct size for children up to the age of 5. Use standards to estimate a toddler’s shoe size from age. The recommended size is 5 for a 12- to 18-month-old child, 6 for an 18- to 24-month-old child, 7 for a 2-year-old, 8 for a 2- to 2 1/2-year-old, 9 for a 3-year-old, 10 for a 3 1/2-year-old, 11 for a 4 1/2-year-old and 12 for a 5-year-old. Have your child stand on a blank sheet of paper wearing socks. Outline the child’s feet with a pencil or washable marker. You can then take the paper to use as a guide at the shoe store. Measure your toddler’s feet. Shoe sizes are determined by foot length from toe to heel. Find the correct shoe size based on length. You will increase one-half size of shoe for each 1/6 of an inch of length. For example, a toddler with a 5-inch foot wears a size 6 shoe, while a child with a 5 1/6-inch foot wears a 6.5 size. Try on the shoes. Manufacturers all have slightly different sizing and shapes, so it is important to find a shoe that fits your toddler well. You should also be careful to try shoes on both feet, as they may be of slightly different size. Measure your toddler’s foot size as close to your shopping trip as possible. If you wait even a few weeks, the toddler may grow. Because toddlers grow so quickly, you may want to purchase shoes that are a half size larger than measurements indicate. While it is possible to estimate toddler shoe sizes from the child’s age, you need to keep in mind that young children tend to grow at very individual rates. One child might wear size 5 shoes at 11 months, while another will not reach that size until close to the age of 2.